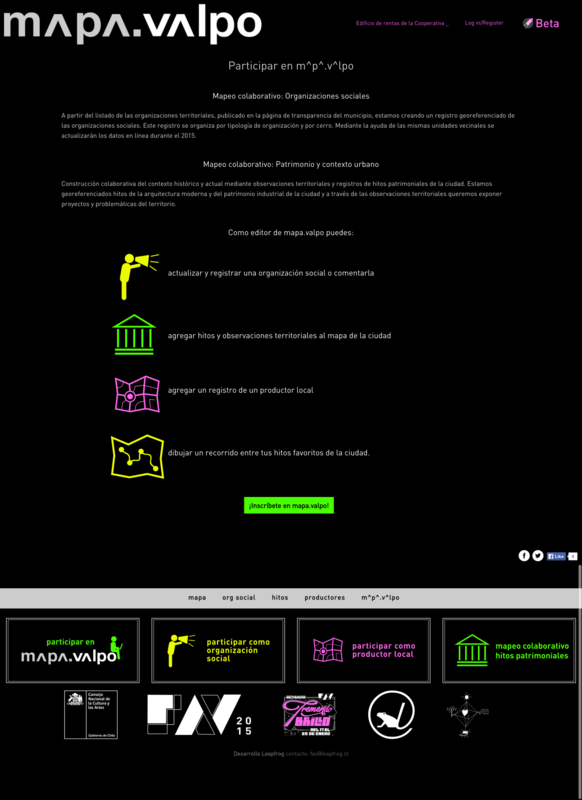 During the month of December 2014 we developed mapa.valpo.net a structure that allows you to add items to a collective cartography. The project was opened to the city in the Festival of Arts of Valparaiso 2015 through online events and 2 workshops with experts that took place in the Centex. The map is configured from different base maps and contains relevant limits of the territory, such as the hills and neighborhood units. 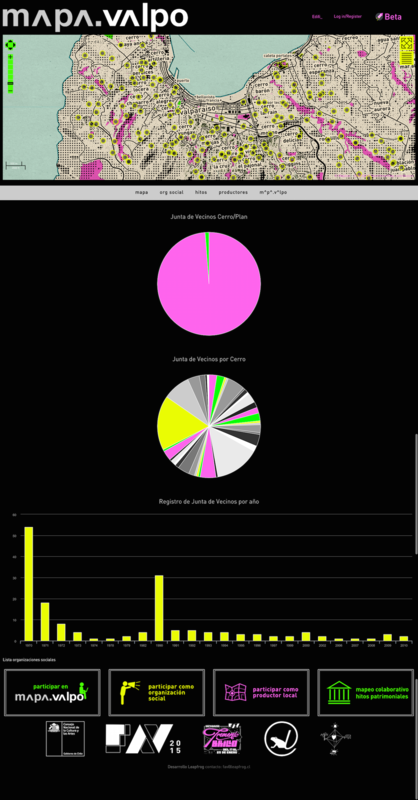 From the list of territorial organizations published on the website of transparency of the municipality of Valparaiso we have created a georeferenced register of organizations that is organized by type of organization and hill and through the help of the same neighborhood units we want to update the data online. The registration extends beyond the neighborhood associations and is open and addressed to Mother Centres, Centres Parents and Guardians, cultural and artistic centers, youth organizations, sports organizations, cooperatives and organizations with similar characters and representing and promoting specific values ​​of a neighborhood community of Valparaiso. In January 2015 we created a record of modern architecture and industrial heritage of the city as a context layer of social organization. 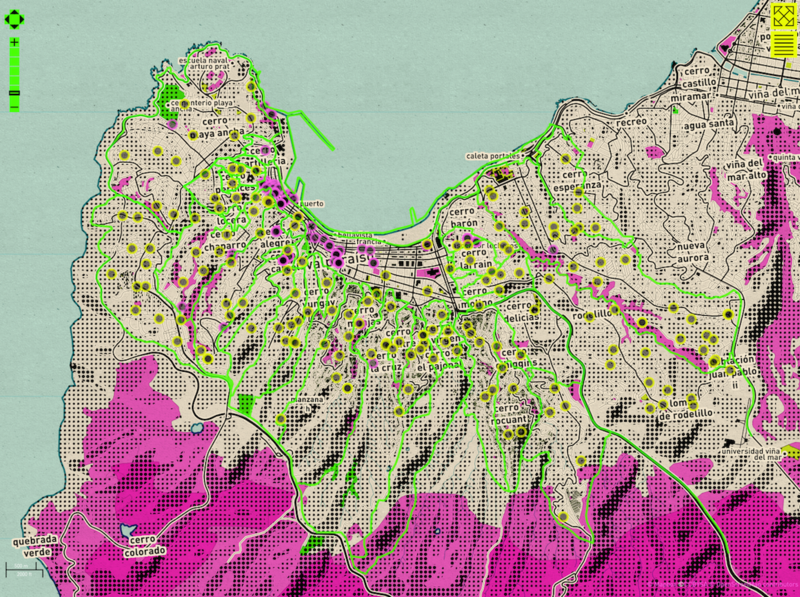 Leapfrog has previously developed an experimental series of digital platforms, based on Drupal, with the aim of empowering citizens to organize and improve the protection of this heritage site: http://cerroconcepcion.org, http://ascensoresvalparaiso .org and http://noalmallbaron.cl.